No. 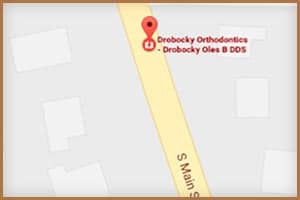 We always offer complimentary consultations so Dr. Drobocky can evaluate your smile and see what needs you will specifically have for treatment. No. You can call our office anytime to set up a complimentary consultation. The American Association of Orthodontists and Dr. Drobocky recommend that you bring your child in for an evaluation by the age of 7. This allows Dr. Drobocky to determine if orthodontic treatment will be required and the best time for the patient to be treated which can help reduce the need for extractions in some patients. The purpose of an early evaluation is to inform and observe, more than to start treatment. At this early age, the eventual needs may be identified and discussed. A small percentage of this young group may need some form of intervention. The patients who need to wait a bit for treatment will join our complimentary growth and development program and become a member of the Drobocky Dinos! We allow an hour and a half for this appointment. 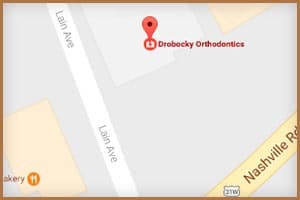 Dr. Drobocky and our Treatment Coordinator will do an extensive exam and if Dr. Drobocky feel that you are ready, we also allow time to get started with some impressions. Absolutely. A growing percentage of our patients are adults. Now, more cosmetic appliances are making adult treatment much more comfortable and convenient. In order to have early and late appointments available for the majority of patients, some procedures need to be accomplished during the hours of 9 and 3. We always do our best to work with your schedules and accommodate your family needs. Yes, you can always contact our office at the phone numbers located at the bottom of the page. If there is an emergency outside of our normal hours you may call the same numbers and get information on how to contact our on-call clinical assistant. 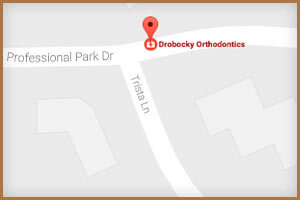 Coming in to see Dr. Drobocky by the at of 7 is the best way to know if either treatment will be necessary. About 10 to 20 percent of young patients may benefit from phase 1 treatment. 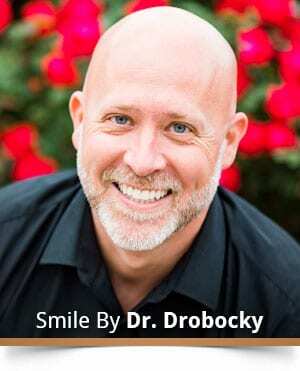 Most other patients are put in our growth and development program and initiated as a member of the Drobocky Dinos! Do you use recycled braces? No. Yes, retainers are worn full-time for about one year followed by nighttime wear indefinitely. Why do teeth get crooked after wearing braces or aligners? Teeth move throughout life whether you have worn braces or not. It is part of the natural aging process. This is why retainer wear is recommended indefinitely to maintain your orthodontic results over your lifetime. For some patients, bonded retainers are attached to the back of lower teeth to keep them in place. This requires special hygiene procedures and regular recalls to the family dentist. Wisdom teeth do not cause crooked teeth but they can cause gum problems, swelling if impacted and trap food below the gum tissue causing infection. It is much easier on the patient to plan for their removal rather than have them removed under emergency conditions.